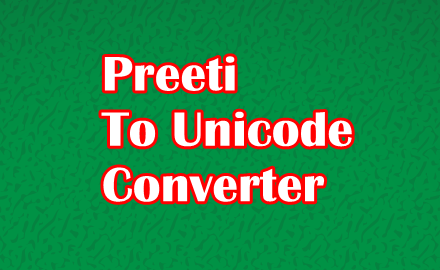 This Preeti to Unicode Converter converts tradational Nepali font Preeti to Unicode, which is widely used in Email & Internet. Any Nepali font in Nepali Unicode is easily displayed in any computer machine. It is good idea to convert Preeti font to Unicode before sending or publishing any document in email or internet which are in preeti font. Type in the text box above to phonetically convert your English text to Nepali Unicode. The conversion to Nepali or Devanagari script happens instantly as you press space bar. Try it for yourself; you will be writing or typing in Nepali in a few moments. After conversion happens, you can easily select your transcribed Unicode text and then copy/paste them to any location. You can paste them in websites like Facebook, email programs like Gmail and in your computer software like WinWord or even Notepad. Chatting, emailing or typing/writing in Devanagari has never been so easy. You can also use the Nepali keyboard above to type characters that they represent. Just click on the buttons of the keyboard and characters will show up in the text box. The reason behind having this keyboard is to enable you to edit manually, correct mistakes or type out some characters which seems impossible with the help of just English alphabets. You don't need to download and install any type of Nepali font to use this tool. Unicode is natively supported by modern internet browsers such as Chrome, Mozilla Firefox, Safari, Opera and even newer versions of Internet Explorer. This feature is also available in mobile versions of these browsers. So, this tool can also be used in your mobile device. No more downloading and installing fonts such as Priti or Kantipur. However, those fonts are still useful for some. The text box converts uppercase and lowercase English characters to different Nepali characters. For example upper case 'A' is converted to 'आ' while lowercase 'a' is converted to 'अ'. Similarly uppercase 'T' is transcribed to 'ट' whereas lowercase 't' is transcribed to 'त'. One more example of character conversion is sa = स, sha = श and S = ष. To get different versions of other special characters just try the capital and small letters in your keyboard. We are also aware that there are additional characters which are phonetically not possible to be typed with Roman alphabets. These special characters have not been ignored in the instant text box conversion feature of our Nepali Unicode converter. Note: You can also use the clickable keyboard buttons above for these special characters. If you run into any problems or you find yourself stuck at times while typing Nepali, then please contact admin@nepali-unicode.com. Your feedback will help to make this English to Nepali text converter tool more easy to use.